Rail Plus today unveiled an exclusive new luggage storage and transfer service in Paris that gives passengers the freedom to fully embrace the City of Lights. Customers using the service are greeted upon arrival by train or aircraft in Paris by a concierge who collects their bags and delivers them to their hotel at a convenient time – which can range from check-in on the same day to one, two or even three days’ later. At check-out, the concierge collects the bags and then delivers them to the train station or airport in time for departure. Rail Plus Commercial Director Ingrid Kocijan says the new service allows customers to make the most of their time in one of the world’s most exciting cities. 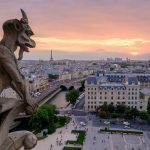 “As soon as the concierge relieves customers of their luggage they can start enjoying Paris, rather than lugging suitcases around for hours while waiting for their hotel check-in,” says Kocijan. The service – which customers can use on arrival and/or departure – must be booked through Rail Plus seven days prior to luggage pick-up. Prices range from $61 for two pieces of luggage for same day delivery, to $129 for five pieces of luggage stored for three days. Kocijan says the luggage service is a valuable addition to Rail Plus’ suite of Paris sightseeing and transport products, including the popular Paris Metro Card (Paris Visite) and ‘Skip The Line – Eiffel Tower’, which provides priority access to the architectural icon on the on the Champ de Mars.